I have a disability. I have a disability permit so that I can park in the appropriate space. Yesterday I was fined $325 for parking in a handicap space. My permit was face up on my dashboard and the ticket was not 8 inches from it. How and why could I have gotten this ticket? My permit wasn't expired, and was easily visable. Re: Disability Parked Car got ticket despite having Permit. Was any part of the car touching or on-top of the hashed lines? 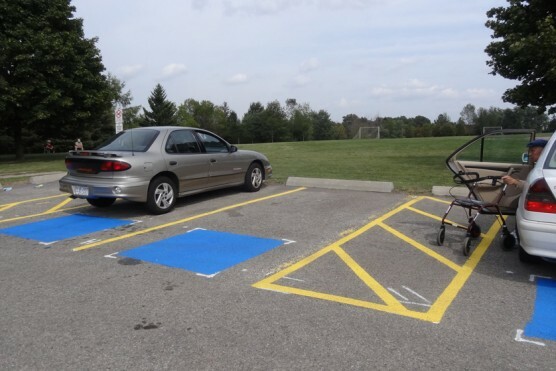 Usually handicap spaces, have hashed lines around them and they're designated access aisles for pedestrian traffic. They're used mainly by disabled drivers/passengers to get in and out of their vehicle with ample space. You can't park or obstruct these hashed lines. The set fine is usually the same as parking illegally in the space (~$300). That's the only thing I can think of, especially if the permit was properly displayed. File the ticket for an early resolution meeting and speak to the prosecutor, and sort out what happened. quite often if you take the permit into the office they will cancel it right there. pickleman357 wrote: How and why could I have gotten this ticket? My permit wasn't expired, and was easily visable.